After arrival at the Cochin Airport/ Railway Station, meet our tour representative who helps with an assisted transfer to the hotel. Complete the check-in formalities and freshen-up. Thereafter, embark on a sightseeing tour. Some of the prime attractions of Cochin that you can visit today include Paradesi Synagogue in the Jew town, Mattancherry Palace, Santa Cruz Basilica, Chinese fishing nets, Ernakulam Shiva temple, St. Francis Church, and more. The Queen of the Arabian Sea, Cochin is a mix of old-world and new-age charm. In the evening, you can also visit the popular markets for shopping. Today, begin driving to one of the most popular backwater destinations of Kerala, Alleppey. Arrive at Pallathuruthy Jetty, and complete the check-in formalities by 12:00 PM. Sail through the stunning attractions of Vilakumaram Thodu and Kanitta. Soak-in the serenity spread all around and savor the delightful views. Enjoy special lunch on-board, prepared by the train chef. The houseboat cruises through SNDP thodu, Kuppapuram, and Vembanad Kayal. Later, halt at Kainakary to partake in canoeing for an hour. This activity here is equally popular amid adventure lovers and nature lovers. 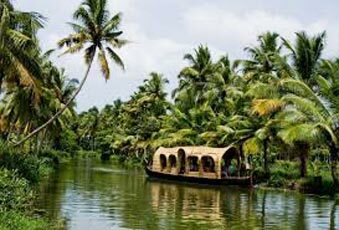 Go aboard the cruise that sets off to Kuttamangalam, Chennengary through Nedumudi. Spot colorful birds, spot the locals indulged in their daily work and more. Enjoy sumptuous delicacies during a traditional dinner on-board the houseboat. Overnight stay on-board the houseboat. The chirping of the birds welcome you in the morning. After a leisurely breakfast, the cruise begins its journey at 10:00 AM towards Thakazhi through Mancompu. The houseboat halts at Pullincunnu dock where the guests get down sightseeing. Some of the attractions include Pullincunnu church, Kottaram temple, and St. Mary’s Church. Next, visit the local statue carving unit and observe the artisans busy in their work. Explore and shop at the local market of Champakulam. You also see Champakulam chundan Vallam- a boat that has been the winner of various snake boat races. Pullangadi and Pindithodu are charmers too. The day’s journey comes to an end at Thakazhi where it is anchored. Dinner and overnight stay on the houseboat. At 07.30 AM in the morning ay day 4, the houseboat cruise resumes its scenic journey via Kanjipadam up to Pallathuruthy Jetty where the guests de-board at cruise at 09:00 AM. A vehicle waits for you here you to drop you at Cochin airport / railway station for onward your onward journey. 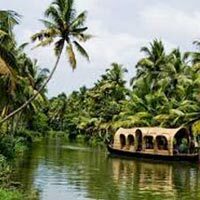 Best Of Kerala –honey Moon Trip :5 Nigh..